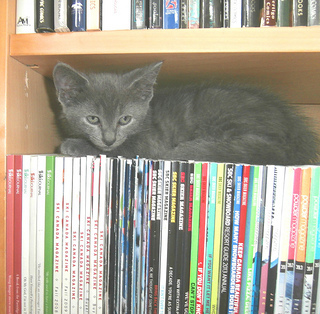 Our current batch of foster kittens at the time of this writing have, though no fault of their own, been more work than usual. 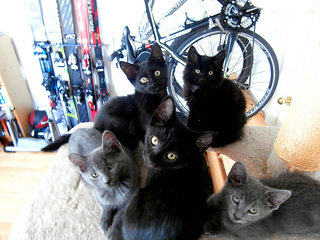 Picked up in a random sweep of ferals living in horrible conditions, this group originated from multiple litters and their mothers’ whereabouts are unknown. 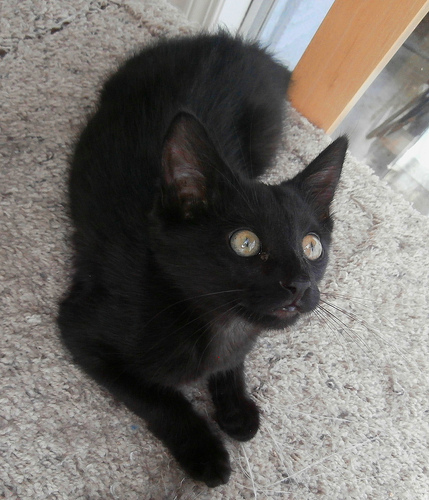 When the kittens first arrived (we originally brought home four), we assumed that the biggest challenge would be Katerina, a very resistant feral with silky black fur, a kinked tail, and enormous frightened eyes. She was so hissy in her carrier that I wondered if I should put on oven mitts to take her out, but she turned out to be a gentle soul. She hissed, spit, and even lunged to try to make herself appear tough in an attempt to scare people away, but she didn’t really want to hurt anyone (a prominent theory on hissing is that cats do it to mimic snakes, which tricks predators into believing that they might be poisonous) . When kittens are terrified, they tend to look angry, so poor Katerina got saddled with the nickname Happy Fun Cat after one of the original lolcats on ICanHazCheezburger.com. 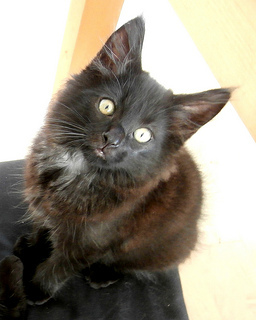 This classic lolcat was a beautiful black feline with large angry eyes. 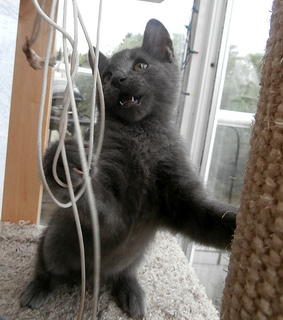 The photo, in which she looked ready to attack, was accompanied by the caption: “Do not taunt happy fun cat.” Although this feral foster kitten’s official name is Katerina, she was often called HFC as a nickname during her first couple of weeks with us, which was actually quite unfair as she was not at all aggressive. 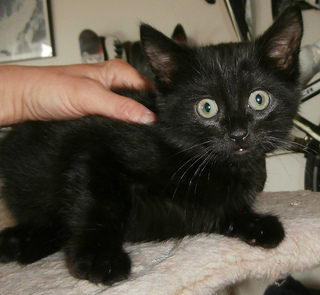 When the kittens were let out of their large starter cage and given a run of our office, we found that Katerina had a nasty limp. She had been quite adept at hiding this from us, which is unsurprising, given that cats have an instinct to conceal injuries that would make them vulnerable to predators. Katerina couldn’t put her weight down on the paw and was obviously in pain. 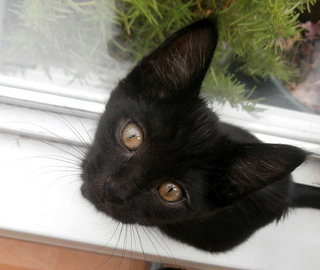 Kittens often injure their legs and develop a bit of a limp for a day or two, and it’s usually not serious (though it’s always worth getting checked out just in case). However, Katerina was already on the mend by the time we discovered the limp and was putting weight on the paw by the end of the day. We don’t know if someone hurt her deliberately or if she was injured in a feral trap and then spent many hours in pain and panicking until people came for her. Either way, her extreme phobia of humans was understandable. 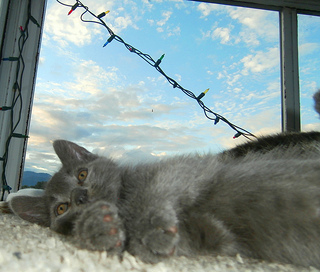 Katerina definitely shows signs of post-traumatic stress disorder (research indicates that cats can suffer from the same anxiety-related issues as people; their moods and emotions are regulated by the same neurotransmitters and they respond to cat-sized doses of human psychotropic medications). However, she gets calmer and happier each day that she’s with us. Katerina has made slow but steady progress. She now enjoys being petted and doesn’t mind being picked up, though she’s quick to revert to feral mode when startled (and she’s very easily startled). We pick her up and hold her a lot, as this is the best way to help a scared feral overcome her phobia of people. Katerina now makes spontaneous social overtures toward us. For example, she will choose to play or sit near me even when she has a full run of the house and she’ll often stretch out her little paws and wiggle them when petted. She even comes to me for attention and talks to me with a real meow (when she first arrived, she was so timid that her meows were silent). She’s also begun to purr when touched and comes when called by name. 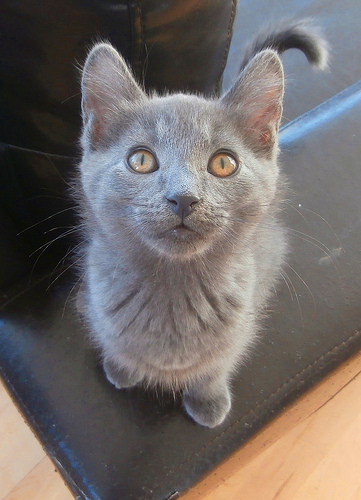 Katerina will probably always be timid with new people, though I suspect that she’ll be a very loving cat for one special person, couple, or family, because she’s already showing signs of being a very affectionate, sweet little girl. She’ll need to go to a home where people will be gentle and calm with her. I believe that Katerina has some Siamese in her lineage, given the way that her body has been elongating as she grows. Her lower face has become increasingly narrow and she’s developing a slender, leggy shape. She’s also very sensitive, intelligent, and athletic, traits associated with the Siamese temperament and physical profile. 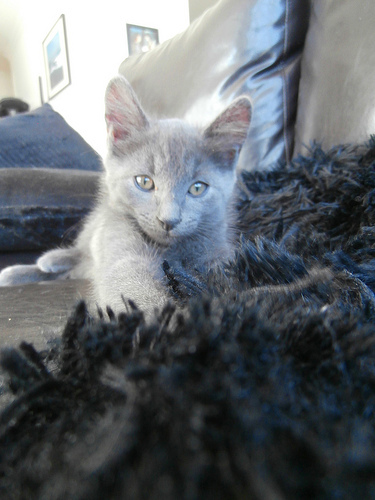 The biggest challenge in the litter turned out to be Hadron, a little gray cat that went downhill rapidly with what appeared to be a severe bout of hypoglycemia, a potentially fatal health problem that afflicts some kittens when they leave their mothers. 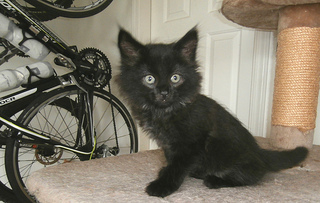 He developed neurological problems and a severe lack of coordination, and was soon too weak to stand or even sit up. Within 24 hours of onset, he couldn’t even focus his eyes. 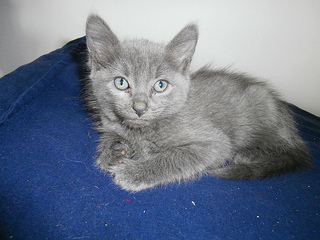 Another gray kitten that had been swept up with a group of ferals now staying at the The Vancouver Orphan Kitten Rescue Association (VOKRA) headquarters had developed similar symptoms, so we were pretty sure that he was Hadron’s brother (nobody knew which kittens were related, which made it impossible to keep all the siblings together after the initial collection). 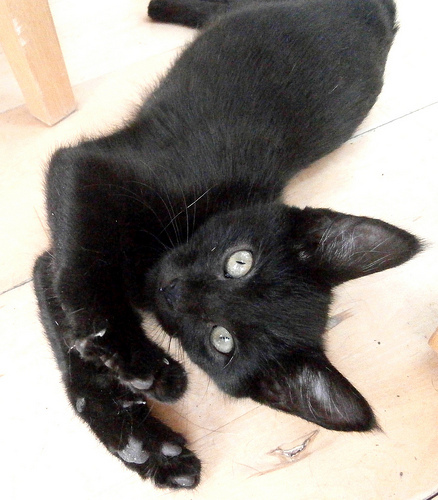 This new kitten, which we named Collider, was not as sick as Hadron, but still quite weak and uncoordinated. VOKRA had recently picked up a large group of ferals living in terrible conditions (one kitten at the site was found locked alone in a birdcage and covered in maggots; she has been cared for at VOKRA headquarters and made a full recovery). 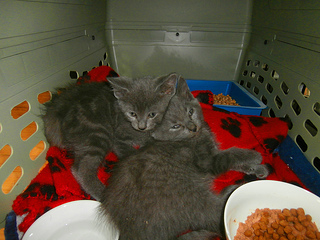 VOKRA volunteers were overwhelmed with medical emergencies as a result of this feral sweep and didn’t have the resources to care for two more very sick kittens, so VOKRA’s coordinator asked if we could take Collider home with us to care for the brothers and medicate them together. 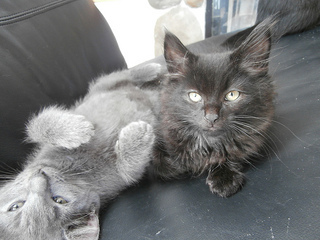 Because we had experience injecting fluids and giving medications, we were the kittens’ best chance for survival. No matter how experienced you are and how well you take care of your kittens, sometimes kittens die and there is nothing that you can do to prevent it. I really thought that the law of averages had caught up with me and I was finally going to lose one; Hadron was so sick it seemed impossible that he could survive. We gave him supplemental fluids, injected into the scruff of his neck (he cried during this painful procedure but never held it against us, snuggling into our arms afterward for comfort). We gave him medications every few hours and I rubbed food onto his teeth and dripped water into his mouth at 20-minute intervals to get some nourishment and extra fluids into him. Hadron wanted to live and he let me know that every time I checked on him. Scarcely strong enough to roll over, he would wiggle his toes at me and purr whenever I petted him or his brother moved near him. When I placed his limp little body near the food dish and held his head for him (his neck muscles were too weak to hold it up himself), he ate as much food as he could manage. Having his brother nearby seemed to lift his spirits. Collider was sick too, though he wasn’t at death’s door like Hadron. However, he needed some fluid injections, medication, and rest as well. Within 24 hours, the boys started showing promising signs including sitting up and eating by themselves, though I still had to place Hadron’s head at the edge of the dish so that he could rest his cheek on the rim to eat. Three of the boys’ feral colony mates were in a large cage next to their “sick bay” carrier and the two little patients were showing a lot of interest in the others so we decided to let them mingle to see what would happen (we’d originally kept the boys separate to monitor their food and fluid intake). Merging the kittens turned out to be the right decision. Whenever they saw the others eating or drinking, the little grays would stagger over to the dishes and do likewise, though they were still so weak that drinking was a challenge. They often ended up choking on and snorting their water unless I held their heads for them. Eventually the grays were drinking on their own and eating plenty of food. 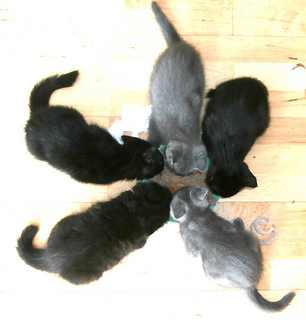 We had been adding so much water to the food to keep them hydrated and avoid the need for further painful injections that the other kittens were complaining about the cuisine, doing a litter-box-style scratching dance next to the plate to inform us that the food tasted like crap. The grays soon began to play with the others, though they were still weak, wobbly, and quick to tire. Hadron, who had been the sicker of the two, often fell asleep on his feet, literally, but his play sessions grew longer and longer and both boys began to develop strength and muscle tone. Soon they could pounce and climb and were indistinguishable from the others in terms of health and energy. 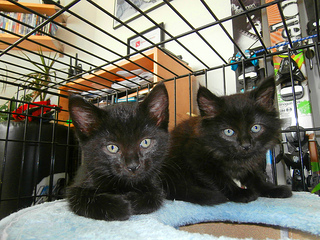 Hadron and Collider are incredibly sweet kittens, very loving, affectionate, and quick to purr. They love being held and cuddled. Hadron seems particularly grateful for our efforts to keep him alive during the dark days. When I’ve held him for awhile and he’s ready to go and play, he’ll first climb up, hug my neck, and kiss my nose or cheek before scampering off. Collider is also a hugger; he’ll often engage in stealth hugs, charging toward me, standing up to hug my leg, and then taking off at warp speed (the boys are quite feisty and energetic these days). The grays show signs of having lost their mother too early. They spend a lot of time attempting to nurse from a fluffy blanket on the sofa that we’ve nicknamed “blanket mommy” (fabric and wool sucking behaviors indicate that cats were parted from their mothers too early; ideally, kittens will spend at least 12 weeks with their mothers, and most will do poorly if they lose them before 8 weeks of age). 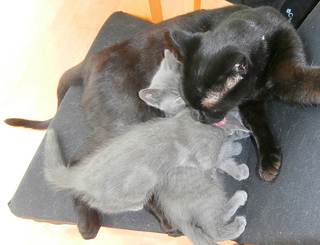 Hadron and Collider also suffer from digestive issues from time to time, a common problem among kittens that leave their mothers too early. 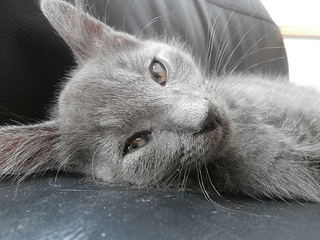 These occasional bouts of diarrhea (which thankfully end up in the litter box and not on the floor) can be stopped quickly by adding a little pumpkin puree to their food (this works for both constipation and diarrhea in cats and dogs; if using this remedy, be sure to buy pure pumpkin, not pie filling, which contains ingredients harmful to pets). 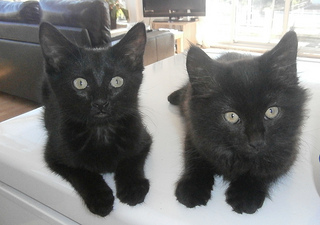 Despite these minor issues, the boys have very good prospects for adoption. 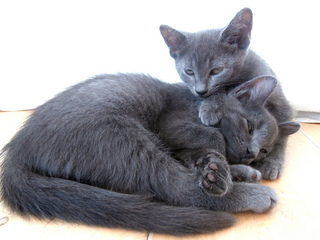 Their lineage is most likely Russian Blue, and gray kittens tend to be very popular with adopters (UPDATE: the boys were adopted on July 28, 2013). Wookey, the third boy in the Fantastic Five group, is fluffy, energetic, and unintentionally hilarious. When he first arrived, he looked like a Tribble with a tiny face and little stubby legs, yet he was surprisingly spry, athletic, and energetic for such a puffball. He’s also a real complainer who will kick up a fuss if the cuisine isn’t to his liking or there’s a single turd in the litter box (he’ll eat the food and use the box regardless, but only after a big show of dramatic floor scratching and squeaky outrage). On the plus side, he’s a fastidious little guy. 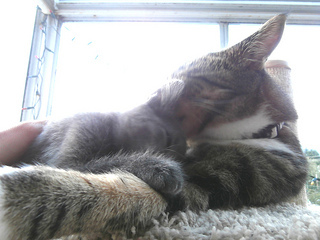 Some long-haired kittens have trouble keeping their fur clean, but Wookey’s is always pristine, which is probably why he finds mess so distressing. 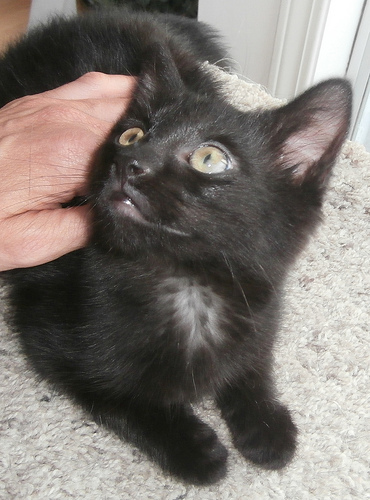 Wookey is an affectionate, sweet little guy who begs to be picked up and enjoys lap sitting. He loves people and other cats, a little too much at times. When he first met our three resident adult cats, he strutted right up to them and began rubbing against them as though they were all old friends. After a few scoldings for being overly familiar, he learned to tone it down and was soon accepted into the colony. A playful cat with a tendency to get underfoot and be occasionally launched as a result, Wookey is only ever lazy during midday because it’s not nice having that much fur during the warm season. He tends to sprawl on his belly with his feet stretched out in all four directions during the hottest part of the day, trying to create as much surface area as possible in order to cool down. 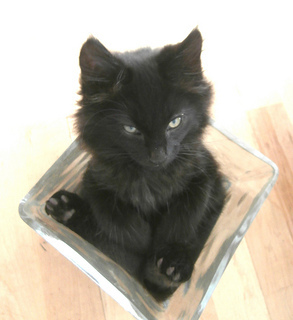 Wookey also likes to pack himself into a small glass vase, squashing his body into a cube shape. He spends so much time in his favourite vase that friends have asked if he’ll need to be repotted when he grows larger. With the intense heat this year, overheating has been a serious concern. Wookey is good at taking a rest during the hottest part of the day, but the others will often play until they’re panting in an attempt to cool down. We’ve had to wrap them in damp towels on a few occasions to cool them off when they’ve over-exerted themselves in 30-degree temperatures (nearly 90 degrees Fahrenheit). During one barbecue we held on a smoking hot summer day, the kittens’ play grew particularly enthusiastic and some of our guests had to be put on kitten cooling duty. 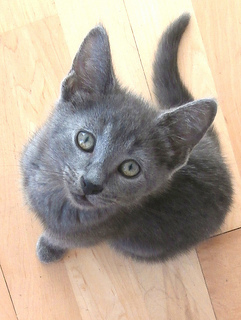 Whirlwind (Whirly), the group’s fifth member, is the perfect kitten, and therefore gets less attention than the others. The squeaky wheel gets the grease, and Whirly never squeaks. Her litter box and grooming habits are perfect, she took to the scratch post right away, she was friendly and happy right from the start (she purrs as soon as anyone touches her), and her health has been consistently excellent. We try to make sure she gets her fair share of attention, but she’s such an easy kitten that she sometimes gets overlooked. 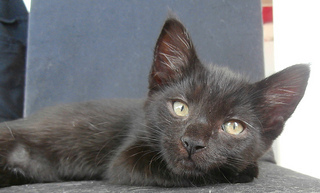 Black cats are the least likely to be adopted (especially short-haired black cats), despite research showing that they tend to have the best temperaments (and Whirly is certainly proof of this). 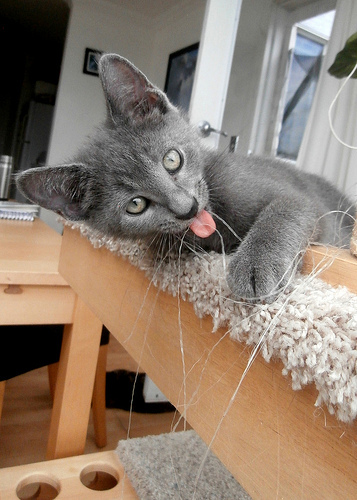 This puts Whirly at a disadvantage for attracting potential adopters via her picture on the site. 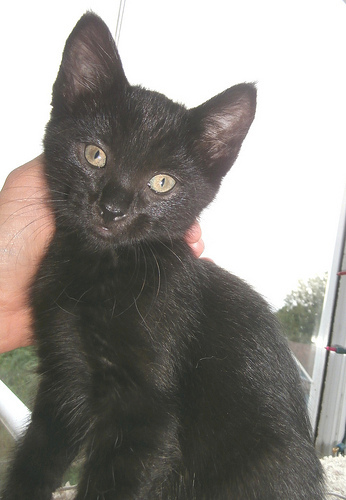 Hopefully some lucky person will notice her profile on the VOKRA website and bring her home. 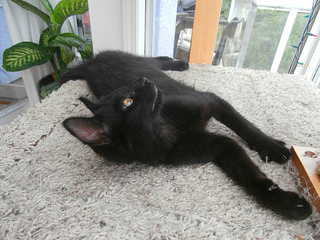 *UPDATE: Wookey and Katerina were adopted together and Whirly was adopted as a companion for a coworker’s young male cat. 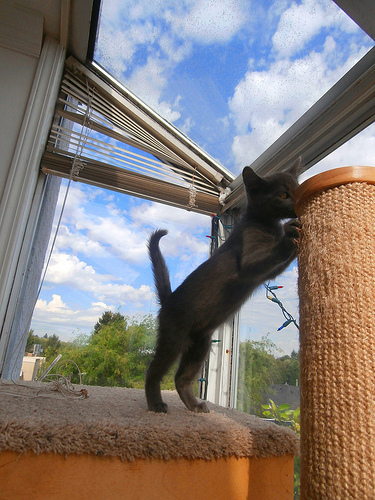 For more foster kitten profiles, see the main Foster Kitten Photo Diary page. 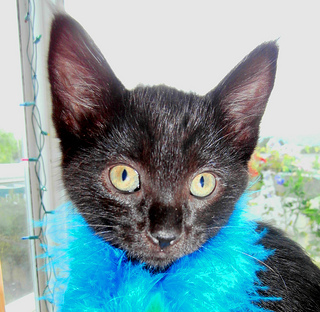 Visit the main Cats page for information about cat psychology, behavior, communication, training, feeding, and pregnant cat and kitten care.